Home / How old is the Indus Valley Civilisation? KOLKATA: It may be time to rewrite history textbooks. Scientists from the Indian Institute of Technology (IIT), Kharagpur, and Archaeological Survey of India (ASI) have uncovered evidence that the Indus Valley Civilisation is at least 8,000 years old, and not just 5,500 years old. It took root well before the Egyptian (7,000 BC to 3,000 BC) and Mesopotamian (6,500 BC to 3,100 BC) civilisations. What’s more, the researchers have found evidence of a pre-Harappan civilisation that existed for at least 1,000 years before this. The discovery, published in the prestigious Nature journal on May 25, may force a global rethink on the timelines of the so-called ‘cradles of civilisation’. The scientists believe they also know why the civilisation ended about 3,000 years ago: climate change. “We have recovered perhaps the oldest pottery from the civilisation. We used a technique called ‘optically stimulated luminescence’ to date pottery shards of the Early Mature Harappan time to nearly 6,000 years ago and the cultural levels of pre-Harappan Hakra phase as far back as 8,000 years,” said Anindya Sarkar, head of the department of geology and geophysics at IIT-Kharagpur. The team had actually set out to prove that the civilisation proliferated to other Indian sites like Bhirrana and Rakhigarrhi in Haryana, apart from the known locations of Harappa and Moenjodaro in Pakistan and Lothal, Dholavira and Kalibangan in India. They took their digging to an unexplored site, Bhirrana — and ended up unearthing something much bigger. The excavation also yielded large quantities of animal remains like bones, teeth, horn cores of cow, goat, deer and antelope, which were put through Carbon 14 analysis to decipher antiquity and the climatic conditions in which the civilisation flourished, said Arati Deshpande Mukherjee of the Deccan College, which helped analyse the finds along with the Physical Research Laboratory, Ahmedabad. The researchers believe that the Indus Valley Civilisation was spread over a vast expanse of India — stretching to the banks of the now ‘lost’ Saraswati river or the Ghaggar-Hakra river — but this has not been studied enough because what we know so far is based on British excavations. 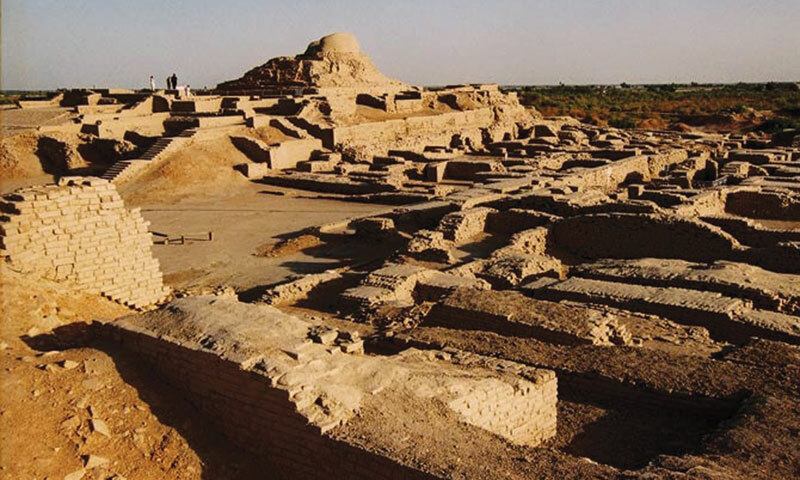 “At the excavation sites, we saw preservation of all cultural levels right from the pre-Indus Valley Civilisation phase (9000-8000 BC) through what we have categorised as Early Harappan (8000-7000 BC) to the Mature Harappan times,” said Sarkar. While the earlier phases were represented by pastoral and early village farming communities, the mature Harappan settlements were highly urbanised with organised cities, and a much developed material and craft culture. They also had regular trade with Arabia and Mesopotamia. The Late Harappan phase witnessed large-scale de-urbanisation, drop in population, abandonment of established settlements, lack of basic amenities, violence and even the disappearance of the Harappan script, the researchers say. “We analysed the oxygen isotope composition in the bone and tooth phosphates of these remains to unravel the climate pattern. The oxygen isotope in mammal bones and teeth preserve the signature of ancient meteoric water and in turn the intensity of monsoon rainfall. “Our study shows that the pre-Harappan humans started inhabiting this area along the Ghaggar-Hakra rivers in a climate that was favourable for human settlement and agriculture. The monsoon was much stronger between 9000 years and 7000 years from now and probably fed these rivers making them mightier with vast floodplains,” explained Deshpande Mukherjee. The Indus Valley people were very resolute and flexible and continued to evolve even in the face of declining monsoon. The people shifted their crop patterns from large-grained cereals like wheat and barley during the early part of intensified monsoon to drought-resistant species like rice in the latter part. As the yield diminished, the organised large storage system of the Mature Harappan period gave way to more individual household-based crop processing and storage systems that acted as a catalyst for the de-urbanisation of the civilisation rather than an abrupt collapse, the researchers say.